Despite its name, the Old English Sheepdog was developed not to herd sheep, but rather as a drover that works with cattle. Aside from working with cattle these dogs were sometimes used as livestock guardians and occasionally as retrievers. Once a year they were also shorn like sheep and their fur was used to make garments.Today they are more commonly kept as companions, particularly in the rural areas of their homeland. The Old English Sheepdog's history is unknown, but the earliest date given is the late 18th century, when they were located mostly in the western country of England. Many have guessed at their ancestry, leaving the most favored ancestors as the Bearded Collie, Briard, Bergamasco, and/or Russian Ovtcharkas. At one point drovers’ dogs were exempt from taxes and to show this status the dogs’ tails were docked, producing a ‘bobtail’ and today that name remains common for the breed in England. 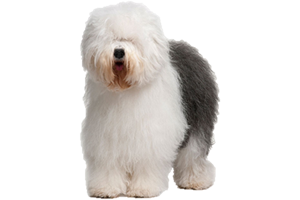 Is the Old English Sheepdog Right for You?